The Pilots opponent on Saturday, Colorado, lost to Colorado State, 72-58. Shooting only 3/19 from behind the arc and 17/31 at the stripe at home had to be frustrating. (The Buffs were favored by 13.5 going into the contest). SMC trailed by 4 at the half on the road against Stanford, but got hot in the second half outscoring the Cardinal, 40-21, for the convincing 66-51 win. Hermanson had 25 for the Gaels. DoubleDipper wrote: The Pilots opponent on Saturday, Colorado, lost to Colorado State, 72-58. Shooting only 3/19 from behind the arc and 17/31 at the stripe at home had to be frustrating. (The Buffs were favored by 13.5 going into the contest). And Lunardi's bracketology out this morning has Colorado as an 11 seed - right in bubble territory. This is a huge game for the Buffs and I doubt they will be taking a road game against the Pilots lightly after absorbing what will be considered a "bad loss" last night for March résumé purposes. And needless to say, Saturday is a great opportunity for the Pilots. Nice to get a Pac-12 and possibly tournament-bound team into Chiles. It's still a bit early in the year, but at this point in the season the RPI's start to swing a bit less wildly based on one or two opponents getting lucky/unlucky on any given night. By this metric Portland is also 4th in the conference at the moment trailing Pacific at #3. Outside of Gonzaga/St. Mary's who have perfect records the conference as a whole has a record a bit over .500 which will be helpful to everyone if it stays that way when conference rolls around in a couple weeks. Looks like RPI is heavily swayed by SOS. 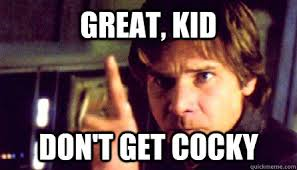 USD 5th in the conf? FYI, Saturday's opponent Colorado is #59. Not going to do anything for the WCC SOS. Hope everyone had a chance to watch UCLA upset #1 Kentucky in Lexington today, 97-92. It was apparently UCLA's first ever visit to Rupp Arena, and it was UK's first loss there after 42 straight wins covering just three months short of 3 years. The Bruins win helped the Pilots move up 3 spots to #125 on KenPom's list. SCU lost at San Jose St 55-40. Was the game called early on account off rain? up7587 wrote: SCU lost at San Jose St 55-40. Was the game called early on account off rain? Haha, I asked almost the same thing, thinking there must have been a power failure that caused them to quit playing. SCU was outscored 27-14 in the second half. Brownridge score 11 points in 39 minutes. UP plays at CS Fullerton on the 22nd, and having just played two games in Titan Gym, one has to hope the Pilots will do better than the Tigers did in their one point loss. The size of the USD win over N. Arizona (15 points) was a bit of surprise for most as NAU was favored at home by 3. LMU dropped a close one at home to our next opponent, Boise St., 80-79. And PU lost at Long Beach St 75-66. LBS now 2-9, winning their only home games. They had lost nine in a row, including to North Carolina, Louisville, UCLA, and Kansas. They need a new scheduler. up7587 wrote: And PU lost at Long Beach St 75-66. LBS now 2-9, winning their only home games. They had lost nine in a row, including to North Carolina, Louisville, UCLA, and Kansas. They need a new scheduler. KenPom rates Long Beach State's schedule as the second toughest in the country, with only South Carolina St. (2-6) playing a tougher schedule. 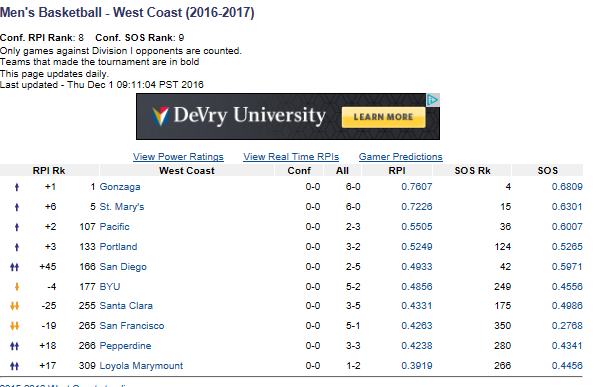 By contrast, UP's schedule is rated the 134th toughest....3rd in the WCC behind SMC (99) and UOP (132). Very interesting....I had no idea this was a thing. LMU beat Southern Utah, 75-68, tonight but UMass overwhelmed UOP, 72-48, and #10 SMC lost its first game of the season, 65-51 to UT Arlington in a "Buy" game in Moraga. SMC lost only one game at home last year, and surprisingly, it was to Pepperdine. It's always a challenge for a team to play just after finals, but that's what the Gaels did, playing their first game since their win over Stanford on November 30. This year on the day after finals conclude the Pilots play South Dakota, a winner Wednesday over Coach Eric Jackson's Montana St, 74-57. While studying for finals today was able to watch Long Beach State fall to 2-10 while earning another $90,000 for Coach Monson in Austin, Texas. Some will be able to watch Monson's team play Oregon State at the Moda Center next Friday after the Pilots play South Dakota....weather permitting. Went to grab a bite to eat with GU leading Akron 42-40 with 10 minutes left and got back just in time to see the Zags win, 61-43....nice finish! The Pilots Friday night opponent, South Dakota, went on a 35-4 in the second half tonight in their thumping of Sacramento St, 72-56, at home. PU lost at USC 93-67. The Waves benched Lamond Murray at the start, and scored only 2 points in the first 5 minutes of play. Savannah State 93, Oregon State 90. Woof. Dean Murdoch wrote: Savannah State 93, Oregon State 90. Woof. If we don't beat Oregon State, I will be incredibly disappointed. Ninja edit: That was Savannah State's first win over a D-I opponent. They are supposedly ranked 350th/351 in someone's RPI. SouthCarolinaPilot wrote: If we don't beat Oregon State, I will be incredibly disappointed. Agreed. One of those "critical for the program" games. You know, looking ahead a bit...the Pilots are favoured by good ol' Kenpom in each of their last four conference games. 68% against South Dakota, 58% against OSU, 83% against PSU, and 66% against Fullerton. The Pilots just got taken to double overtime at home by a team ranked about #330 in the country...not sure if it's possible to be cocky at this point! StudentPilot wrote: While studying for finals today was able to watch Long Beach State fall to 2-10 while earning another $90,000 for Coach Monson in Austin, Texas. Some will be able to watch Monson's team play Oregon State at the Moda Center next Friday after the Pilots play South Dakota....weather permitting. I blame the upcoming cold weather on your comment. I mean if butterflies can affect things massively imagine what using electrons to post can do. SCU beat UC Riverside 77-53.